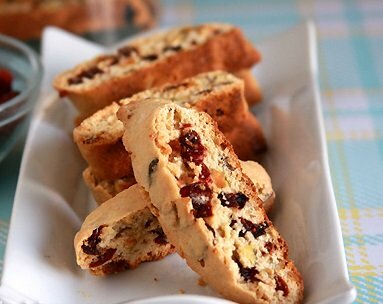 This Biscotti Toscani is a traditional recipe, that doesn't contain butter or oil. The texture is crisp and crunchy, predominately almond flavored with a hint of orange from the added zest. Making your own fresh zest at home is easy. Zest has many uses, such as adding flavor to baked goods, serving as a garnish on certain foods or for flavoring drinks. Various common kitchen implements can be used to create zest, such as a grater, vegetable peeler, knife or microplane. Microplane or fine grater is the easiest, but if you can only cut or peal the top layer off the lemon, lime or orange, all you need to do is dice the peal very, very fine. 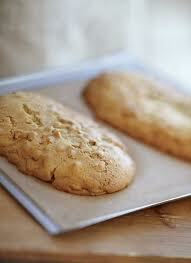 The most distinguishing feature of these biscotti is the chunks of almonds. For this recipe use whole blanched almonds, toasted and then coarsely chops. To intensify the almond flavor, add a little pure almond extract. 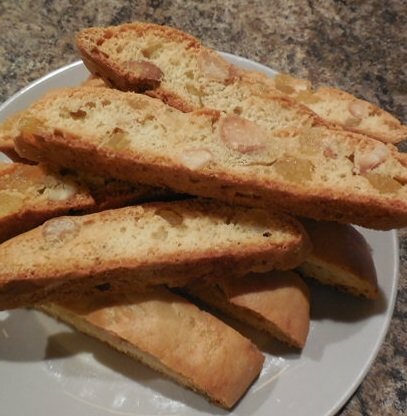 Almond extract has a very intense almond flavor which is why you only need to add a small amount to achieve a really nice almond flavor in these biscotti. These twice baked cookies have a delicate flavor, great with vanilla ice-cream, tea, frozen yogurt, or cappuccino. In a large bowl, cream butter and sugar until light and fluffy. Beat in eggs, vanilla, almond extract, and zest. In another bowl combine flour, baking powder, nutmeg, and salt. Stir into the creamed mixture until just blended. Mix in almonds. Divide dough into two pieces. Form into long flat loaves about 1/2 inch tall and 12 inches long. Place the loaves 2 inches apart on the prepared baking sheet. Bake in preheated oven for 25 minutes, or until a light golden brown. Remove from oven and cool on a wire rack for 5 minutes. With a serrated knife, cut diagonally into slices about 1/2 inch thick. Lay the slices flat on the baking sheet. Bake for 10 minutes, turning over once. 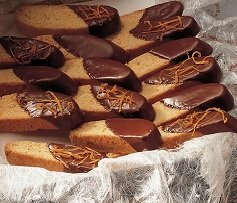 After cool store biscotti at room temperature in an airtight container. Special Note: These Biscotti Toscani are actually good for upset tummies. The low sugar content and light flavor help sustain you when you don't feel much like eating anything else. At least that is my excuse for eating them!